This hike begins where the Pacific Crest Trail crosses Forest Road 24. Heading south on the PCT for about 1.4 miles, the trail junctions with Spur Trail #107 that climbs up on the high west side of Sawtooth Mountain. This route is described on the information for Hike 66. However, this hike to Wood Lake just continue on PCT #2000 for another mile and you will come to the junction of the Spur Trail #107. You continue to follow the PCT for another mile or so and you will come to the junction of Trail #108, which leads down to Cultus Creek Campground. 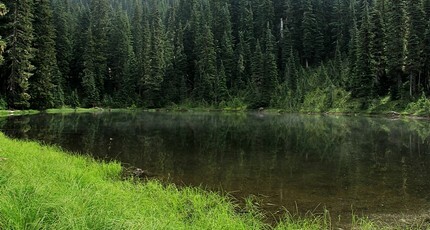 Just a few feet beyond this junction, is the junction to the Wood Lake Trail #185. Follow this trail downhill for another half mile and you will come to beautiful Wood Lake. Follow the Wind River Hwy north through Carson. In 7.5 miles you will pass through the little community of Stabler, and in another 5.8 miles you will come to the junction of Forest Road 30. Turn right onto FR30 and follow this road for 13.2 miles north along the Wind River and then up a steep incline and onto a plateau where	you will come to the junction of the Curly Creek Road. Continue north on FR30 for another 5.1 miles and you will come to the junction of Forest Road 420. Continue north on FR30 for another 5.5 miles and you will come to the junction of Forest Road 24. 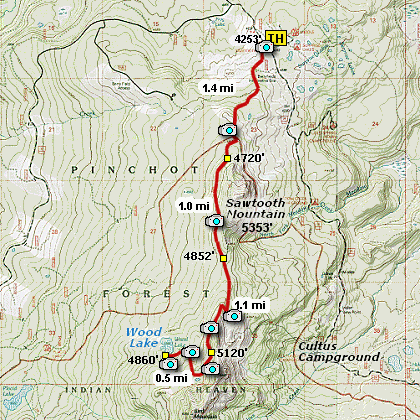 Bear right onto FR24 and follow it for about a mile and you will come to the trailhead for this hike, which is the PCT. From Hood River cross over the toll bridge ($2.00) on the Columbia River to the junction with SR14. Turn left onto SR14 and drive approximately 1.5 miles to state road 141 Alt. Turn right onto SR141 Alt. and follow it another 2 miles and merge bearing left onto SR141. Then travel north on SR141 for another 19 miles to Trout Lake and the junction to Forest Road 23, which heads north to other destinations. Bear left and continue on SR141 westbound out of Trout Lake for about 5.5 miles and you will cross into the Gifford Pinchot National Forest and the road changes to Forest Road 24. Continue westward on FR24 for another 2.5 miles and you will come to the junction where FR24 turns north. Turn right and continue to follow FR24 north for another 5 miles and you will pass the trailhead for Wapiki Lake. Continue on SR24 for another 4 miles and you will come to Cultus Campground on your left. Continue on for another 3.5 miles and you will come to the parking area for this hike, where the Pacific Crest Trail crosses FR24.